If I had a nickel for every time someone told me how handsome I was, I would be so rich! Ha! Well Nickel just happens to be my name and I am about 2 years old weighing in around 50lbs. 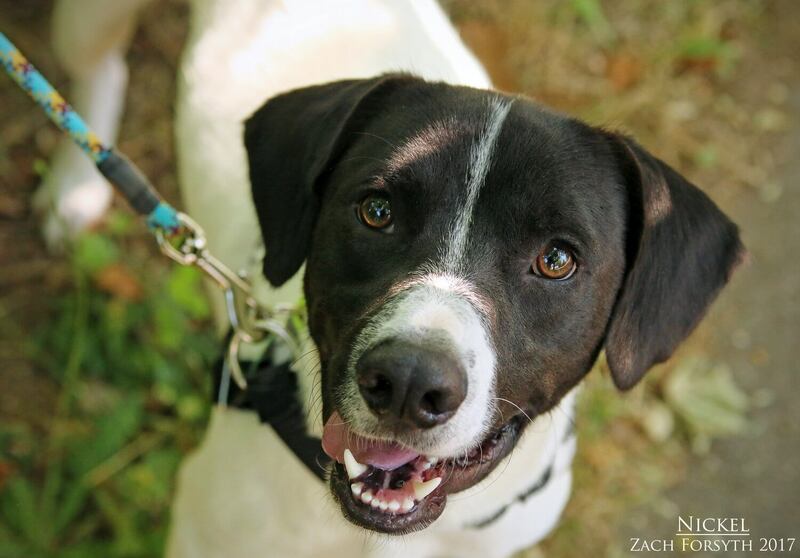 Being a Pointer mix, I am looking for a rural home with someone who can provide me with the appropriate mental and physical stimulation I need! I am a very smart boy and a fast learner, and I would love to utilize my brain with either some fun interactive training or maybe some physical exercise of running around in a nice big yard with a confident puppy pal. I can be a little shy at first with people, but I bond quickly to my favorite pals over 12. The city is a little overwhelming, so a quieter home would be ideal. No kitties in my home please! I really am a sweet guy who loves to play. So fill out an application today and we can meet! I come to you neutered, vaccinated, and micro-chipped with an adoption fee of $300.